Well, I was on a streak of 3 solid weeks of 35-45 miles each, including two 20-22 mile runs and a few 15+ mile runs. It was a good, and even somewhat adventurous three weeks too! I helped a father and daughter who had car trouble outside of Freeland. I saw a turkey vulture nest from about 50 feet away. Then, a rash of end of the semester meetings, family changes, organizing an Earth Day event for nearly 200 people, a garage sale, and other events conspired to keep me indoors all this week. I like to think of it as an unplanned rest week. That isn't unreasonable either as next week is finals week and then I am out for the summer. Okay, I have three different research projects going, but I can, more or less, set my own hours, which means getting out on the road will be much easier. Also, since I won't be teaching, I think a running commute is possible with fewer logistic complications (e.g. if I run too slow, I won't have 30 students sitting around wondering where I am). So, I'm really looking forward to classes being over and continuing the streak I was on earlier. I haven't mentioned this before, but I'm also well on my way to earning a little (and I do mean little) cash for all this running. Our university is sponsoring a program, which rewards employees for healthy activities, including exercising. We get 5 points for every 30 minutes of exercise. If you get 1,000 points by the end of the year you get a $150 gift certificate. Moreover, whoever has the most points at the end of the year, wins $1,000! I'm already at 700 and haven't really put in any heavy training miles yet! Of course, if you quit smoking you get 500 points just for that... We shall see how the rest of the year goes. Anyway, hopefully I'll have time to blog more once the semester is done. I would like to congratulate Dave, Lauren, and Yassine who all pulled down some excellent times at Boston. Lauren even appeared in a Columbus newspaper! Also, congratulations to Toni who completed the London Marathon while raising money for aid dogs. I'm glad to hear that you accomplished your goals running and fundraising! I will be glad when this semester is over. Only about one more month. First of all, good luck to Dave and Lauren, who will be running in Boston. That's a great accomplishment. Also, good luck to Toni who will be running the London Marathon soon. She's done a great job raising money for assistance dogs. You can check out her blog and donate money to this excellent cause here. So, I use "running culture" as an example in classes sometimes and it makes me wonder about running identities. I read the other day in Ultrarunning magazine that just over 1,800 people completed 100 mile runs last year. That is approximately 0.000006 of the US population. I find this fascinating because the sense I have is that the ultrarunning community really likes to exist as a fringe activity (i.e. something that not many people do). This isn't to say that running 100 miles requires more or less dedication or training then fast marathoners or even those preparing for their first marathon. In fact, someone on the ultrarunning listserve noted that many 100 mile runners don't run much more than 40 miles per week so I'm not sure it is fair to say that the training is more rigorous or difficult (note that people who run 40 miles/week aren't the ones who win ultramarathons--just complete). So, while some argue that people are driven to the "challenge," I think this overlooks the very subjective nature of challenges. I certainly enjoy the exotic nature of the sub-sport and like the fringe identity. Importantly, I think this fringe character and small number of participants has created a different culture. There is an emphasis on challenging oneself, rather than challenging other people--you see this in race reports that emphasize completion rates, rather than first, second, and third places. Everyone who finishes the race (or in some cases finishes under 24 hours) gets a medal (or belt buckle). There are fascinating variations, such as the Plain 100, whose rules are simple: You receive nothing from anyone. Water comes from streams or lakes. Despite my fascination with gadgets, there is an elegant simplicity to that which I appreciate. Consider also that everyone who runs an ultramarathon has their name appear in the same magazine. Sure, winners are noted and such athletes are and should be admired. Still, everyone is in there. The number of people who completed 100 mile run increased in 2007 and I expect will increase in 2008. While I look forward to helping those numbers increase, I do wonder as to how this will change the character of the sport. Hey, on a side note, Scott Sigler, the author who helped publicize my run last year released his first hardback novel, Infected, today. Mine arrived in the mail and it is pretty slick. I listened to the novel when he first podcast it and will probably bring it to read on the way to Cuba. You can get it on Amazon.com or pick it up in Barnes and Nobles stores around the country. For more information go to www.scottsigler.com or www.infectednovel.com. Read the book to find out why the shirt I wore last year referenced chicken scissors. You might not want to know the answer. Well, my blogging has definitely taken second chair to other aspects of my life lately. I can't complain though. I just got back from a weekend with family and friends celebrating Elliott's birthday. We were at Pokagon State Park in northern Indiana and I kept telling myself that I would sneak away for part of the weekend to hit some trails. 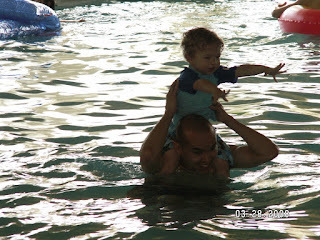 However, we discovered that Elliott really likes to swim and I couldn't pass on splashing around the pool with him. It was a great time and thanks to everyone who was there. My running has been hit and miss too. I've had a couple 40+ weeks interchanged with 30+ weeks. I'd really like a solid string of 50 milers to make me feel like I haven't lost too much endurance over the winter, but really haven't had the time. I did get through a solid 13.5 mile run today in the middle of a wind advisory (I love Elliott's jogging stroller, but aerodynamic it isn't) so I think I'm still in reasonable running condition. Fundraising efforts have actually not fallen to the wayside. I've been in contact with a few other runners who are interested in raising money to support lupus research this year. I don't want to give any details yet, but we are cooking up something interesting. I'll keep ya'll updated.